It's only a week or so into 201...and your room is already a *total* mess. Ugh, so much for that New Year's resolution of getting organized, right? But don't give up just yet. 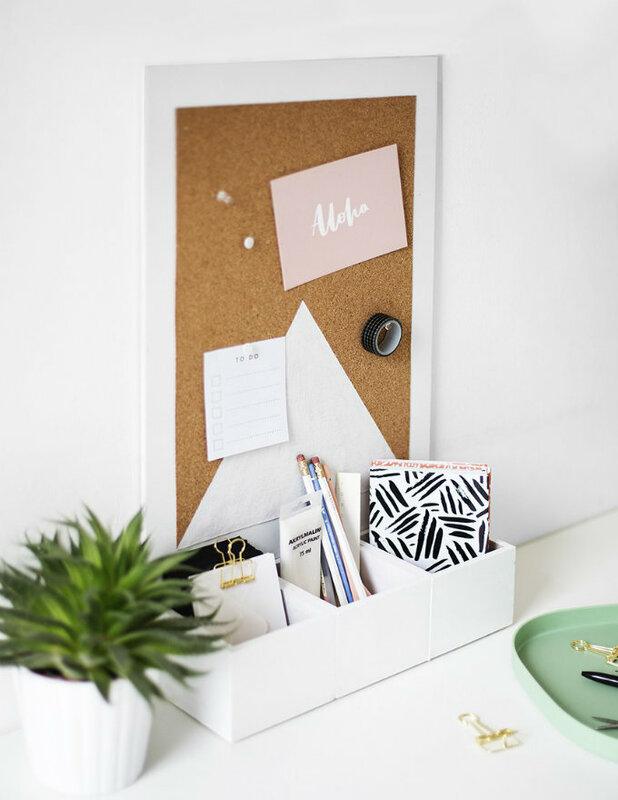 With this DIY desk de-clutterer, you'll have a space that's as clean as it is chic. Now just remember that putting things away when you're done with them and spending just a few minutes a day re-organizing is key to keeping it that way! *You can find these things at your local craft store like Michael's. 1. Spray paint the wood and boxes in whatever color you'd like. Let dry, then glue the boxes together using your wood glue. 2. Next glue the wood board onto the back of the boxes to make a stand-up organizer (again, use the wood glue for this). 3. Measure the inside of the board so you know how big to make your cork sheet. Then, trace the dimensions onto your cork sheet and cut out with the X-ACTO knife (ask your parents to help you here). 4. To create the white triangle in the center, tape down a triangle shape onto the cork sheet with your washi tape or painter's tape. Spray paint the area and let dry. 5. Adhere the cork sheet to the wood board and you're all done! How do you keep your desk organized? Let us know in the comments! Tutorial credit: Sugar and Cloth.